It was difficult to believe what unfolded in front of me Friday afternoon. Gov. 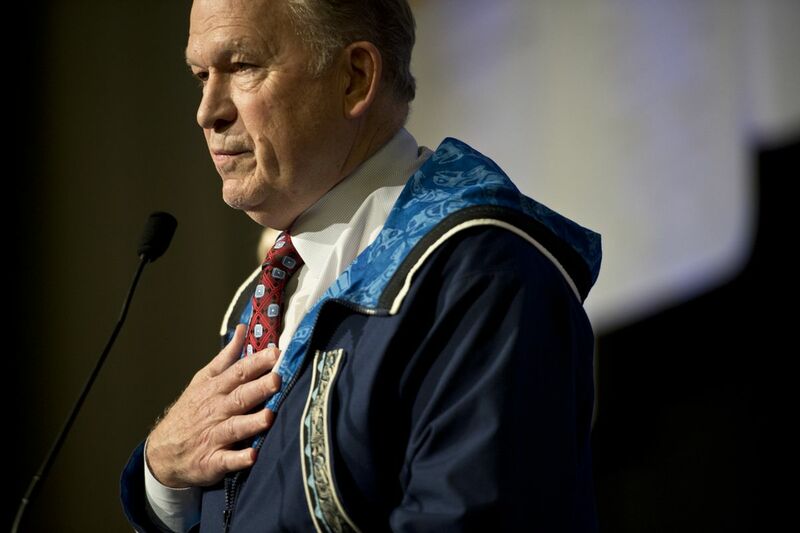 Bill Walker asked the organizers of the Alaska Federation of Natives' annual convention for permission to make an unscheduled address, and before hundreds of people in a giant ballroom, announced he was suspending his campaign. He explained the events of the past few days made it impossible for him to win and, to ensure the survival of his values – and the values Alaska Natives share with him – he was halting his campaign and supporting Democrat Mark Begich. Walker was joined on stage by perhaps 25 Native leaders who, after he finished, thanked him for his service to Native people in words and several songs. The leaders hugged Walker after finishing their individual remarks. Walker seemed comfortable enough as he listened to the extended praise – although he might as well have been attending his own funeral and hearing renditions of "He was a man who …" But when I saw him up close as he was leaving the building, he seemed pale, sweaty and exhausted – like a man who had spent a sleepless night on an airliner with broken air conditioning. In less than a week, the Walker administration had been destroyed. Walker will now serve out the rest of his term, which ends in December, as the lamest of ducks. In his scheduled remarks to the convention Thursday, Walker explained that Lt. Gov. Byron Mallott's departure from the Walker-Mallott ticket was a matter of "accountability." But "accountability" for what? Virtually everyone attending the convention knew that Mallott had been accused of sexual misconduct and resigned. But what form of misconduct? A Walker staffer, citing the need to protect the woman's privacy, would not say. The conduct involved words — offensive words. As the staffer explained, there had been no pawing, groping, etc. Byron Mallott has been a fixture at AFN conventions for decades as a Native leader and elected official. Once upon a time in the 1960s, he was the boy mayor of Yakutat – a public figure since before many if not a majority of the people in the hall were born. Now he has disappeared, become a non-person like an old Bolshevik in Stalin's Soviet Union. It is important to remember Mallott was a public official when he disappeared. He was not Walker's employee – he was not hired like a bank executive. He was not appointed like a member of the cabinet. He was elected in 2014, by almost 135,000 Alaskans who voted for him. The lieutenant governor is usually deferential to the governor, but the governor is not really his supervisor. The governor cannot fire the lieutenant governor for failure to perform his or her duties. Nor withhold his or her pay. Nor keep him or her out of the capitol. The remedy for a lieutenant governor who has gone amiss is impeachment by the Legislature, the people's representatives. Or an recall election, by the people themselves. Or a general election – again the people themselves. But as a Walker staffer reminded me, any public official can decide to resign. Of course, the lieutenant governor can be arrested for a crime. But nobody says Mallott committed a crime. He is accused of being offensive – or disgusting, if offensive doesn't satisfy you – of behaving like a cad when all over the U.S., cads have become pariahs. So who decided that his behavior was so appalling he had to go? Mallott himself after restarting his conscience and concluding a gentleman had only one choice? Walker? The offended woman? The public – who elected Byron – deserved an explanation, and they didn't get one. I am not talking about an explanation in detail violating the woman's privacy. She didn't have to be named. But Walker needed to tell us how an elected public official went down a rabbit hole without any public process – only with what you would hear from Hawk Harrelson announcing a strikeout at a Chicago White Sox baseball game: "He gone." Now Walker is "he gone" too, beloved by the Native community but with his hopes for re-election dashed, partially by his colleague's misconduct. (And not just a colleague – Walker called Mallott "my brother" many times). This may be the most spectacular case of collateral damage since sexual misconduct began to dominate the national news. Gov. Walker said he wanted an administration characterized not just by "accountability" but "respect." Noble words. But noble words taste like ashes when you are accountable for someone else's misconduct and respected for what you did yesterday and have no tomorrow.